Start with a bag of colored candy melts, food coloring and oil. Melt the candy melts according to package directions and then add a few drops of bright food coloring. Mix together and then add 3 tablespoons coconut oil. 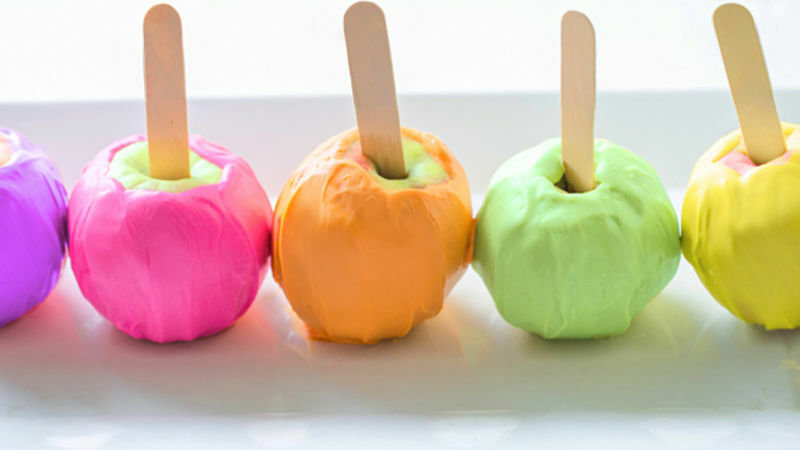 Put a popsicle stick in the top of the apple and then dip into the candy melts. Place on a plate to cool. Follow the same instructions with other colors of candy melts to get a rainbow effect. Summer makes me think of the county fairs that are taking place all over the country. I see posters advertising fairs everywhere, and drive by them every weekend. When we stop in, one of my favorite things to grab before hitting the bumper cars is a candy apple! I've made yummy caramel candy apples a few times, and there's always the popular chocolate-dipped with crazy toppings, but I wanted to try something different. So I made ultra-bright, neon frosted candy apples that are sure to grab party-goers' attention! I made a variety of hues with food coloring, candy melts and some coconut oil (you can use vegetable oil too). I put them in our window box, and when my husband came home they brought a big smile to his face! They're sweet and delicious, and add a bright and happy feeling just sitting on the platter. It's like being at the fair, but without the lines. And just wait until you try them! To make your own, melt the candy melts in a glass bowl. Then add your desired food coloring and stir. When the mixture cools just a bit, add in a few tablespoons oil and stir some more. Then dip the apples into the melts and place on a plate to dry. Repeat the process for more colors, then enjoy the rainbow!